Money leaks, just like water leaks, can be devastating. Have you ever had a leak in your house that caused a lot of damage and cost a lot of money to fix? A couple of years ago, my family and I went to the grandparent’s house for the long Thanksgiving weekend. We had a good visit, and when we returned home, as we pulled into the driveway and opened the garage door, there it was. The ceiling of the garage was now in the floor, soaking in a large pool of water. Obviously again, we had forgotten to turn off the water to the house before we left town. Once we got upstairs I discovered that something inside our washer had malfunctioned. As it turned out, a valve was leaking very slowly, drop by drop, enough to cause major damage after four days of dripping. The linoleum in the laundry room had bubbled up, the carpet in the hallway was soaked, and the hardwood in the kitchen was warped. So we called our insurance company and they sent someone right out to estimate the damage and get fans and dehumidifiers working to dry everything out. A day or two later a contractor came to check it all out and make a plan to get everything back in good condition. Thank God we had good insurance. After a week or two of getting subfloors dried out, the contractor was able to get to work replacing, linoleum, drywall, hardwood, trim, carpet, paint, etc. Overall, it was about 2 months of inconvenience to fix the damage and get everything back to normal again. Finally! No more inconvenience of a torn up house and workmen coming into the house several days a week. So anyway, I’ve told you all of that to tell you this: Having a leak in our house that caused a lot of damage is just like the money leaks you can experience in your personal finances. It’s so easy to get complacent with your money and let little drops leak out here and there that, over time, can end up causing a lot of damage to your financial situation. This is how you can easily get into large amounts of credit card and other debt that eventually begins to overwhelm you and over time will make your financial house crumble. Most people don’t get a credit card and then quickly go out and charge $10,000 worth of stuff over a few days or even a few weeks. But the drip, drip, drip of making small and medium sized purchases over a few years that ends up in $10,000 or $20,000 worth of credit card debt is a pretty common story. Add that to other types of debt like cars, personal loans, home equity loans, and others, then the drip becomes a flood, causing a lot of damage. So how do you get rid of your money leaks? You actively take control and take steps to prevent them. If we had turned off the water to the house when we left town like we knew we should, we would not have experienced the damage and inconvenience of a water leak. If you take control of your money by sitting down and doing a written spending plan (yes, a budget) every month and stick to it, you’ll find where the money leaks are and learn to plug them up, allowing you to stop living on more than you make. 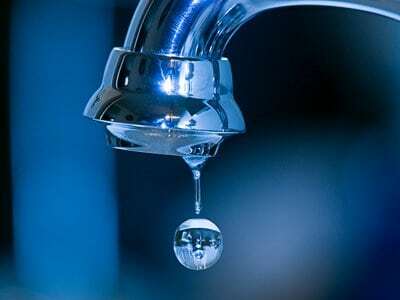 Of course, there’s a lot more you have to do to repair and restore the damage that your money leaks have caused by drip, drip, dripping over the years, but getting control and stopping the drip is one of the first steps in the process. When you begin to stop the dripping and begin repairing the damage to your financial house, then you start winning with money! Oh man! that sounds exactly like my first experience with a credit card. I’m focusing on the drips of “monthly bills” that we don’t need or use right now, but I just got an urge to check out hot water heater! 1. Use a budget to control the money drips. You must have a plan. 2. Always, always, always turn off the water to the house when you leave for a few days!